Singapore is a country in Southeast Asia, located at the southern tip of the Malay Peninsula. It is made up of a number of islands and forms a very popular destination on the tourist map of the world. The cultural diversity, rich heritage and exotic natural legacy of Singapore attract hordes of tourists every year, with the result that tourism has become one of the major industries there. Apart from being a great shopping destination, the country also boasts of numerous venues for art lovers, magnificent islands, picturesque beaches and opportunities to see nature in its wild and true form. The cuisine of Singapore is luscious and its night life, totally pulsating. Read on to get some fun and interesting facts on Singapore. The official name of Singapore is ‘Republic of Singapore’. ‘Singapore City’ forms the capital of Singapore. Singapore is situated in Southeast Asia and spreads over a total land area of 682 square km. Singapore is a republic, with a parliamentary system of government. The main religions of Singapore are Buddhism, Islam, Christianity, Taoism and Hindusim. The national flower of Singapore, Vanda Miss Joaquim, is a natural hybrid between V. teres and V. hookeriana. Singapore is made up of one main island and 63 other tiny islands. Most of the islands of the country are uninhabited. Singapore's residents are mainly descendants of immigrants from the Malay Peninsula, China and the Indian sub-continent. 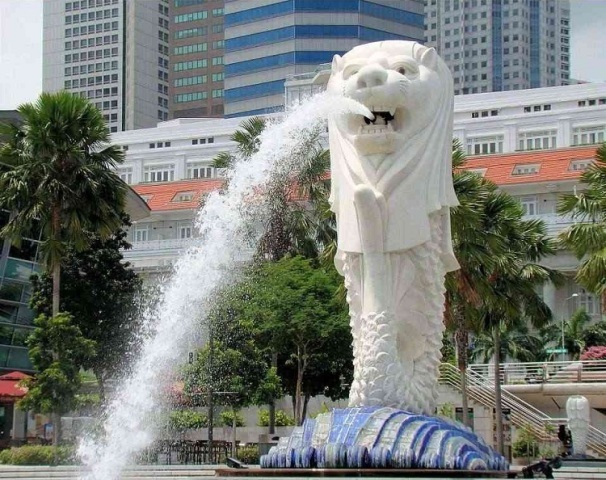 The symbol of Singapore is ‘The Merlion’, half-fish and half-lion beast. English is the official working language as well as the most widely spoken language of Singapore. Malay, Mandarin (Chinese) and Tamil form the other official languages of the country. British pop violinist Vanessa Mae Nicholson was born in Singapore. Bukit Timah Hill, 164 meters high, forms the highest natural point in Singapore. Eric Khoo's ‘12 Storeys’ was the first Singaporean film to be shown at the Cannes Film Festival. Singapore became a member of the United Nations on 21st September 1965. Singapore boasts of housing ‘The Night Safari’, the first night zoo in the whole world. Singapore has more than 3,000 km of roads. Singapore is counted amongst the 20 smallest countries of the world. However, it is the second most densely populated country in the world, after Monaco. Singapore is the largest exporter of ornamental fish (25% of the world market). The highest man-made waterfall of the world, 30 m high, is located at the Jurong Bird Park of Singapore. The largest fountain of the world is located at Suntec City in Singapore. ‘Changi Airport’ of Singapore has received the honor of being named as the ‘Best Airport Worldwide’ , a number of times, from the UK/Europe edition of the ‘Business Traveller’ magazine. Though there is no scientific explanation for it, it has been seen that more Singaporeans are born in the month of October than any other month of the year. Around 90 percent of the people in Singapore live in public housing flats. Tan, Lim and Lee are amongst the most common Chinese surnames in Singapore. Around 80 percent of the people in Singapore own cell phones. As per the records, the telecom companies in the country issue around 30,000 to 40,000 new numbers every month. The Singapore Sling was first served at the ‘Long Bar’ of the Raffles Hotel, in the year 1915.